Approaching Iroquois Lock upbound, Nov. 13, 2008. 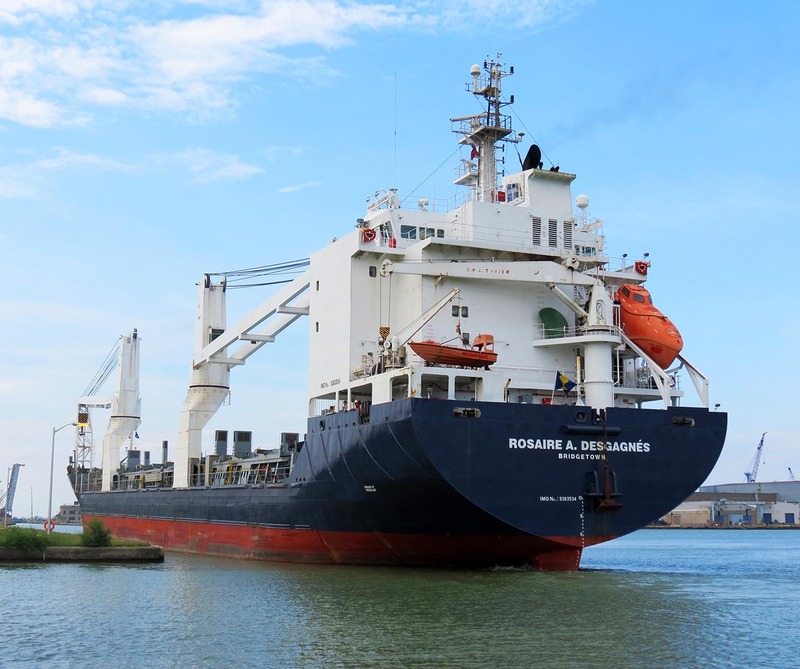 Rosaire A. Desgagnés (C831580) is the first of three new Beluga type E/F-240 multi-purpose dry cargo ships to join the Desgagnés fleet. This vessel was built as Hull J2/001 by the Jiangzhou Union Shipyard at Ruichang, China, and completed in July 2007 as Beluga Fortification. The new ship arrived at her homeport Quebec City on August 28, 2007, and was formally christened Rosaire A. Desgagnés on August 29. It soon went to Valleyfield, Quebec, to load for the Canadian Arctic. The vessel has an overall length of 452 feet, 11 inches, a beam of 68 feet, 10 inches and a molded depth of 36 feet, 1 inch. It is calculated at 9,611 gross tons, 4,260 net tons and can carry 12,777 tons deadweight. There are three cargo holds and each one is served by a single hatch and is equipped with removable ‘tween decks that can be used as additional bulkheads if needed. There are two 120 metric ton electric-hydraulic, port side-mounted cranes that, when twinned, can provide a 240 ton lift up to 50 feet from the ship’s side. Rosaire A. Desgagnés is powered by a six cylinder, model 6M43 MAK/Caterpillar diesel engine that develops 7,344 brake horsepower. It is coupled to a single controllable pitch propeller and the vessel has a service speed of 15.5 knots. Electrical power is supplied by three 395 kilowatt diesel generators and one 750 kilowatt shaft generator. The ship is also equipped with a 500 horsepower bow thruster units. It can carry 12,744 metric tons or 673 TEU containers at a mid-summer draft of 26 feet, 3 inches. Under a normal full load, the ship consumes approximately 23 metric tons of fuel each day. The vessel is fully certified for world-wide trading and is classed as GL+100A5 E3, the equivalent to Lloyd’s 100 A1 Ice Class 1A. Rosaire A. Desgagnés operates in the Arctic supply runs each summer and worldwide trading under an operational agreement with the Beluga Group of Germany through the remainder of the year. It is re-registered in Barbados each year for deep-sea service. The vessel has also visited the Great Lakes, bringing cargoes of pig iron to Marinette or Menominee as well as to the Essar Steel Export Dock in Sault Ste. Marie, Ontario. 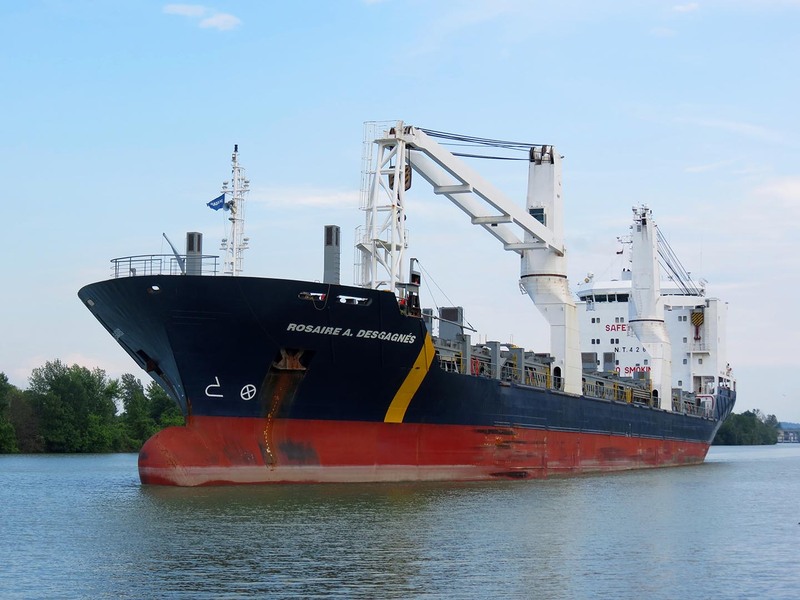 Named in honor of Captain Rosaire A. Desgagnés, a well-known and respected individual in the Canadian maritime industry and a man who has made an outstanding contribution to the success of Groupe Desgagnés. Loaded and ready to depart Cote Ste Catherines wharf for the Lower Arctic Communities, Sept. 4, 2007. A view of the equipment loaded on deck. The tugs Grizzly and Etoile Polaire on deck. Undergoing repairs from ice damage in the Arctic, Aug. 8, 2008. Unloading pig iron in Marinette, Nov. 19, 2008. The William H. Donner's cranes are used to unload the Rosaire. Upbound in the Welland Canal below Lock 2, Nov. 9, 2010. Sails down the St. Lawrence at Mariatown, Nov. 23, 2010. Downbound in the Welland Canal above Lock 1, June 25, 2013. Upbound in the Detroit River, May 22, 2016.